It’s Father’s Day already and it’s important to focus on…how much he loves his tools! From the “117-Tiny-Useless-Accessories Toolkit,” to the latest “thing” from Black & Decker, there are lots of ways to waste his time and your money. Not to worry though, here is a gift that will keep him happy and actually get used. I bought this kit almost a year ago and have used both the drill and the impact driver for every application thinkable. The impact driver makes driving long screws easy and reduces the number of stripped screws. The amazing thing about this little Makita 10.8v impact is that it delivers 800 inch-pounds of torque! That amount of torque combined with the small size makes this tool a time-saver on any job. Small size gives better access in tight spaces. LED light stays on for several seconds after trigger is released letting you see your work without the drill rotating. Heard rumors of batteries failing after being dropped…pretty common result with Li-Ion batteries though. SPECIFICATIONS: Models DF030D driver drill and TD090D impact driver. Lightweight and maneuverable. Each Tool weighs two pounds or less. 1/4-inch hex chuck. Built in LED lights to illuminate work area. Drill: 18-torque-settings delivers up to 195-inch-pounds of torque. Impact Driver: generates 800-inch-pounds of Torque. 1.3 Ah Lithium Ion Battery technology for more work. 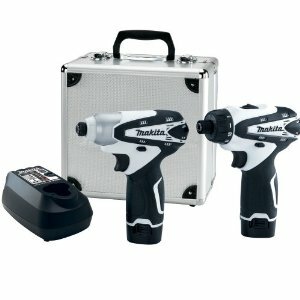 Includes: driver drill, impact driver, Two (2) 10.8-volt lithium ion batteries, charger, and heavy duty aluminum case. Previous post: Free Bosch Oscillating Tool Adapter!